A meerkat and one of Simba's closest pals. He found Simba, almost dead of thirst, when he was just a cub. Timon and his best buddy Pumbaa taught Simba their motto, Hakuna Matata, which means "no worries." And that's how Simba grew up — with no worries, taking life one day at a time. A warthog and one of Simba's closest pals. He found Simba, almost dead of thirst, when he was just a cub. Pumbaa and his best buddy Timon taught Simba their motto, Hakuna Matata, which means "no worries." Some folks are a bit put off by Pumbaa's pungency, but a kinder fellow you'll never find. Timon and Pumbaa are a meerkat and warthog, respectively, living in the Pride Lands. They only appear in Kingdom Hearts II. Timon and Pumbaa grew up in the Oasis with Simba, and the trio lived a carefree life until Nala found Simba and tried to convince him to go back to the Pride Lands with her. Alongside Sora, Donald, and Goofy, Timon and Pumbaa help fight Scar's hyena army. Timon and Pumbaa live by the motto Hakuna Matata, which means "no worries" in Swahili. Sora, Donald, and Goofy first encounter Timon and Pumbaa at the Oasis in the Pride Lands during their first visit. They are hunted by Nala, who is ready to pounce on them. However, she is stopped by the timely arrival of Simba, who joyfully reconnects with his childhood friend, much to Timon's incredulity. Though initially frightened by Sora's lion form, Timon and Pumbaa eventually form a bond with him, even teaching him the meaning of Hakuna Matata. After Simba and Nala have an argument about going back to Pride Rock to take down Scar, the five of them enter the area chanting Hakuna Matata. Later, Timon and Pumbaa help the entire group to try and take down Scar. However, their attempts ultimately fail and they are cornered by Shenzi, Banzai, and Ed in a cave, though they are soon rescued by Sora, Donald, and Goofy. Once Scar is defeated, Timon and Pumbaa witness Sora unlocking the world's Gate, the former remarking on the resulting glow. During Sora's second visit, Timon is first seen encouraging Simba, who still has some self-doubts about becoming the new king. Later, at the Oasis, Timon notifies Sora, Donald, Goofy, and Simba of the numerous ghosts of Scar that are haunting the Pride Lands. Pumbaa protects Nala from Scar's ghost up on Pride Rock, despite being frightened by the apparition. After the defeat of the Groundshaker, he is present for Sora's second departure from the world. Timon is the erratic and wise-cracking. Although short in stature, his personality is not. Timon is very self-absorbed, often claiming the genius ideas of Pumbaa as his own. Like Pumbaa, Timon has embraced the carefree motto of "Hakuna Matata," using it not only as a way of life, but also to cheer others up. Oftentimes, when the meerkat is in danger, he will cower behind Pumbaa as means of protection. However, Timon will gather up his courage to help a friend in need. 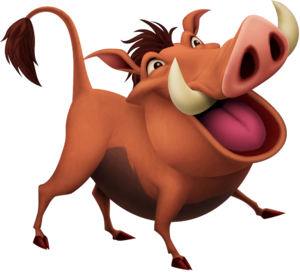 Pumbaa has a lax and carefree life, much due to the philosophy of Hakuna Matata, that he can be perceived as ignorant or passive. This is not the case, however, as most of his ideas are quite genius and/or helpful. As for passivity, Pumbaa will only excuse actions until they affect his friends. When that happens, he will charge to protect and help them. This is seen during the end of the first visit, when Pumbaa bravely fights, and pummels the hyenas in a fit of rage. Pumbaa disapproves of anyone call him a "pig", and becomes enraged whenever someone does. Timon is a small meerkat with light tan fur over most of his body, save for the front, which has white fur. The tips of his toes, his fingers, half of his tail, and his large nose are all brown. The ridges of his ears and his "eyebrows" are dark red and his eyes are brown. He also has light brown rings around his eyes. 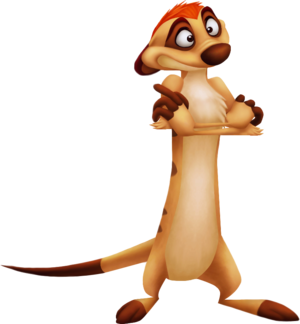 Timon's ears point downward and he has an unexplained, short, spiky head of orange "hair" on the top of his head. His back sports several horizontal, grey stripes. Timon's forearms are unnaturally thin, particularly when compared to the size of his hands. The fur on his chest and elbows is ruffled. Pumbaa is a warthog with light tan fur and dark red cloven hooves. His belly is grey and his eyes are brown. True to his species, Pumbaa sports two large, ivory tusks jutting out of either side of his mouth. The tips of these tusks curve upwards sharply. Pumbaa has a large, flat snout which is pink at the front. His ears are set just behind each of his eyes. He has a very large mouth and a pink tongue. Finally, Pumbaa sports a tuft of shaggy brown hair on the tip of his tail and on the top of his head, the latter creating a mohawk-like mane. Timon and Pumbaa originate from the 1994 film The Lion King. After running away from the Pride Lands, a young, unconscious Simba collapses from heat exhaustion in the desert, where he was discovered by Timon and Pumbaa. Although Timon initially refuse Pumbaa's suggestion to take the young cub under their wing in fear that Simba might eat them, he agrees to take Simba in after Pumbaa persuaded him. After Simba awakened and introductions were made, Timon and Pumbaa spent the next few years teaching Simba their lifestyle in the jungle and their "Hakuna Matata" philosophy. When Simba's childhood friend, Nala, reunites with Simba, Timon and Pumbaa learn that Simba is the rightful heir to the Pride Lands, which was being ruled by Simba's villainous uncle, Scar. Later, Timon and Pumbaa spy on Simba and Nala's romantic evening, depressed that they will lose their friend to her. The next morning, Nala, Timon and Pumbaa were informed by Rafiki, a mandrill friend of Simba and his father Mufasa, that Simba has returned to the Pride Lands to challenge Scar's for the throne. Joining Nala, Timon and Pumbaa follow her to the Pride Lands and was then forced to do a hula dance to distract Scar's hyena followers in order to let Simba and Nala to sneak into the Pride Lands unnoticed. After being chased by Banzai, one of Scar's hyenas, Timon hurries into Scar's cave and ends up being locked in Zazu's cage. Fortunately, Pumbaa rescues him, freeing Zazu and Timon. After Scar's defeat, Timon and Pumbaa decide to stay and live at Pride Rock with Simba and Nala. They also have their own animated television series, Timon and Pumbaa. Timon is the main character of The Lion King 1½, which tells the story of the original movie from his perspective, with Pumbaa being the deuteragonist. They both reappear as a supporting characters in The Lion King II: Simba's Pride. Pumbaa means "to be foolish, silly, weakminded, careless, negligent" in Swahili, while his name means "boar" in African. Timon's original voice actor is Nathan Lane, who was occasionally replaced in other media as Timon's voice by Quinton Flynn, who voices Axel and Lea in the Kingdom Hearts series.